After I published my first post, my son started questioning me about why I needed to take photos of Fifi. Questioning, wanting to know why, seems to be part of his Asperger’s character. Then he asked if he could look at the blog. So, I gave him the URL. He spent a long time reading through the posting. I spent the time wondering if he was going to be upset by the fact I was writing about him. He wasn’t – in fact, he asked me to correct a couple of points, which I did. At that point I decided to ask him if he thought I should use his name; would that be ok? My son’s name is Geordie – and I will be using his name now in future postings until the time he changes his mind and asks me not to. In retrospect, I should have talked to Geordie before I started this blog. Being open and honest with him has always been the best strategy. He is cluey – and despite all the talk that suggests children on the spectrum are not naturally aware of social cues – Geordie is very aware of when I am holding something back from him. This little scenario has served to remind me that knowing your child and what pushes their buttons is so important. What has a stuffed dog got to do with Asperger’s? 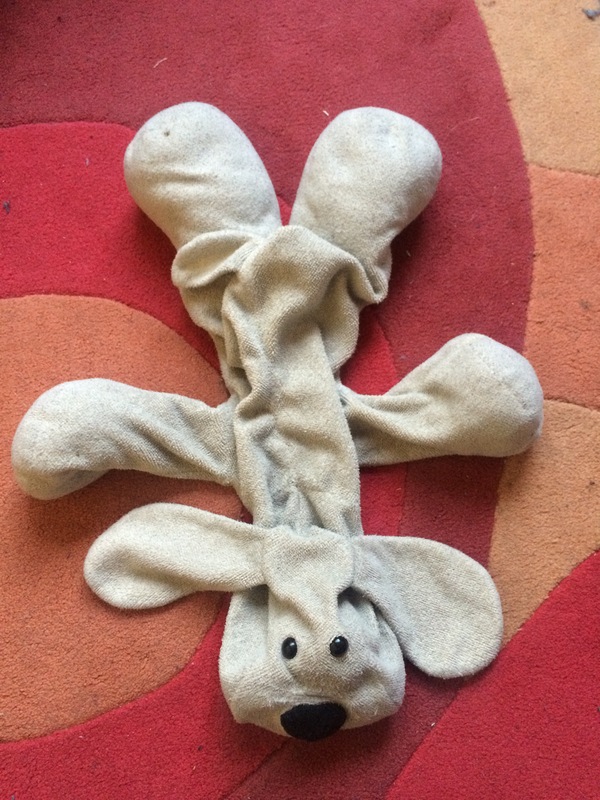 This is Fifi – my son’s well-loved, but ever suffering, stuffed dog. Fifi was given to my son on his second birthday – two years before he was diagnosed with Asperger’s Syndrome. Over the last eight years, Fifi has become more than the favourite toy; more than the only ‘family member’ who can bring my son out of a meltdown. Fifi has his own ‘world’, and it has become both a sanctuary for a little boy and a place of learning for me. I have heard people describe children on the autism spectrum as ‘being in their own world’; I have also heard people say that it is wrong to use that terminology. In my son’s case, I would have to agree with the latter – he is firmly ensconced in our world, but he sees many things differently. Through Fifi’s very own world, aptly named Fifi’s World, this floppy, grimy dog has become my son’s voice. It has taken me a while, but I have eventually come to realise that what is happening in Fifi’s World is my son’s interpretation of the things that are going on around him. Essentially, Fifi’s World is how my son deals with the daily happenings in the confusing and confronting world in which he lives. What is the ‘amaranthine’ journey I refer to in my tagline? I will admit to doing a Google search to find this word. I wanted a word that suggested ‘continuous’ or ‘never-ending’ but with a less negative connotation and amaranthine popped up. The stem of the word is ‘amaranth’ which comes from old Greek and refers to a mythical unfading flower. The adjective, amaranthine, describes something which is ongoing, yet not unpleasant. It can also allude to a purplish-red colour which, interestingly, is a colour my son was drawn to as a toddler. So – I had to use it. To be honest, this blog would not be in existence if it wasn’t a requirement in my Professional Writing and Editing course. However, writing about my family’s Asperger’s journey is something I’ve been doing for a while and I am excited that I have been given (or should I say, forced into) this opportunity to relay our journey to other like-minded people. Fifi’s World has given me a deeper understanding of my son – and this enlightenment is what I hope to share with you.